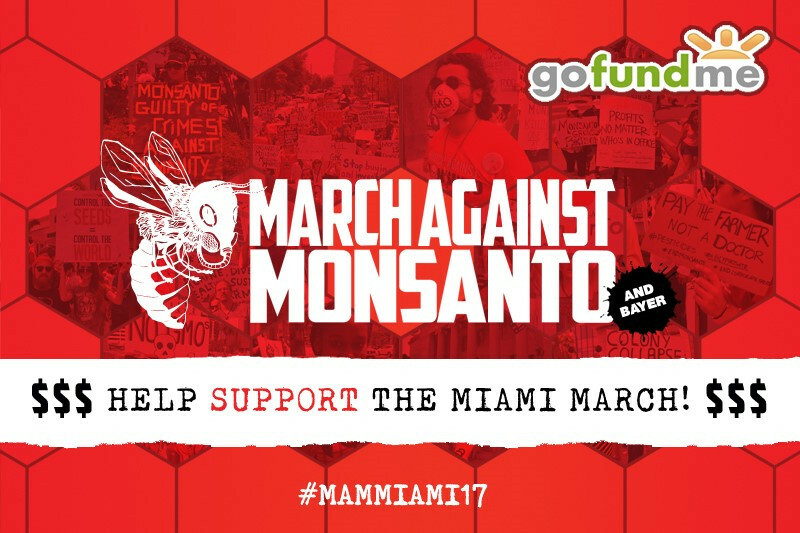 Riding on the tsunami of global change, let's make The 5th Annual Miami March Against Monsanto-Bayer on May 20th a phenomenal success this year! The eyes of the world will be on us Miami, let's really shine! In previous years we have had 2000 people march in Miami alone and over 10,000 people across our great state! Help us make this march the strongest impact ever! We need your support to help us spread the word and cover costs of the march. We are very excited to announce that that infamous Reverend Billy will be speaking and performing at the march! Please help us secure the funds to bring the rest of his performance troupe, The Stop Shopping Choir. They are a renowned New York City based radical performance community. We are so very lucky to have them be part of our March Against Monsanto. We are joining over millions of people, in over 600 protests worldwide! South Florida's diversity is the strength of our community. Once a year we come together to march in solidarity for our health, our well being and our planet. We join millions of people around the world and create a collective ROAR, chanting, singing, dancing and marching down city streets. The March Against Monsanto Bayer is not only a protest, but also a way to educate the citizens of Miami and beyond. With knowledge we have power and are empowered. People have the right to know about the adverse health effects associated with GMOs and Monsanto's corrupt business practices. Help us protect our food supply. Planning an event of this magnitude requires time and money to make it a Success. Any contribution, no matter how big or small, will help to cover out-of-pocket costs. The producers of the march are all unpaid volunteers. Your contribution covers costs including: advertising and promotion, and operational costs. In the United States, the FDA, the agency tasked with ensuring food safety for the population, is steered by ex-Monsanto executives, and we feel that’s a questionable conflict of interests and explains the lack of government-led research on the long-term effects of GMO products. WHAT ARE THE SOLUTIONS WE ADVOCATE? *Voting with your dollar by buying organic & Non-GMO project label, supporting your local organic farmers & boycotting Monsanto-owned companies that use GMOs in their products. *Labeling of GMOs so that consumers can make those informed decisions easier. *Repealing relevant provisions of the US's "Monsanto Protection Act." *Calling for further scientific research on the health effects of GMOs. *Holding Monsanto executives and Monsanto-supporting politicians accountable through direct communication, grassroots journalism, social media, etc. *Continuing to inform the public about Monsanto's secrets. *Taking to the streets to show the world and Monsanto that we won't take these injustices quietly. *We will not stand for cronyism. We will not stand for poison. That’s why we March Against Monsanto. PLEASE OFFER YOUR SUPPORT WITH A CASH CONTRIBUTION TO HELP US COVER EXPENSES. You do not have to make a donation to attend. And, you do not have to attend to donate. Click here for rally and route details and to join us at the MARCH AGAINST MONSANTO - Miami on May 20th. Get Involved! Help Plan The March! Please share this page with your friends, family and co-workers. And, please help us make this an unforgettable event with your cash contribution. RSVP:On our facebook event page for details on Miami's march and after party at ToeJam Backlot in Wynwood. Visit March Against Monsanto To Learn More –or- find a March near you! In the event we have funds left over from the Miami March Against Monsanto, it will be rolled over into the non-profit GMO Free Florida and used for future GMO-related events and initiatives. If you are a business donating to the March, or would like to table the after party, we will be delighted to do a shout for your business and thank you on our Facebook and Twitter pages. If you’d like to sponsor the march, we will place your logo on our fliers, brochures, T-shirts and Shouts on Jolt Radio. Calling all Yoga Studio Owners in South Florida...here's a great opportunity for you to take your practice off the mat and into the political realm, the grocery store, farms and on your fork while also promoting your business. The March Against Monsanto is less than 1 month away...worldwide and also in Miami. Here is an opportunity to sponsor the march/after party. We have had up to 2000 people in the past and expect a yuge turn-out this year as we all participate in the resistance. PM me for details on sponsorship, all the perks and promos as well as being part of the after party at ToeJam BackLot in Wynwood. Thank you for your tireless efforts organizing this large-scale event! Thank you from the Florida Keys! Outstanding event March Against Monsanto Miami 2017! Trish Sheldon is an inspiration! Sorry I was too sick to make it down. Was really looking forward to this. Much love for all you do!